Everything began with the fortuitous meeting between a kabbalistique essay and a big round board on a wet pavement, one morning of big riddance in the neighbourhood. The unexpected discoveries often inspired me diverse uses, in engraving or in painting. The big size of this board made an original support for a painting. The fate, which had put this object on my road, made me read to the same period a book of Raymond Abellio and Charles Hirsch, " Introduction in a theory of biblical numbers ", in whom they develop their theories in the light of the regular polygons angles of which in the center have integer values. These are among 22, as the letters of the Hebraic alphabet. 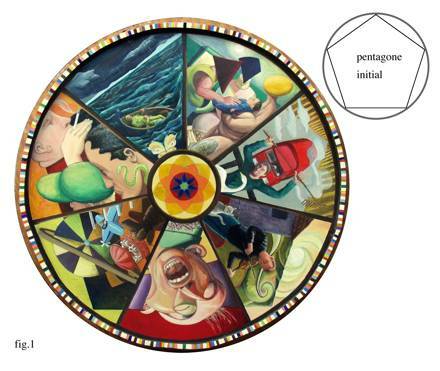 Pushed by the curiosity and the need "to see" these polygons, I began to register on the circumference of my picture(board), of which I still ignored the future contents, 360 compartments corresponding to the integer angles of a circle. A lot of compartments of the circumference are the summits of several different polygons, from the one in 360 sides up to the triangle, by example the point 180 is one of summits of all the polygons having an even number of sides (there are 17). I tried to determine the simplest of these figures for every integer value of angle. I moved closer to the numbers between 1 and 360 of their biggest common divisor (BCD) with 360, because the BCD between a value of angle on the circumference and 360 gives us the biggest integer value of the angle in the center of one of the polygons carrying this point. Every measure of angle being bound to one of the famous 22 particular polygons, this calculation supplies the simplest figure, the polygon with the minimal number of sides having this point for summit. Two examples : the number 120 is its own BCD with 360 and its position on the circle is one of summits of the equilateral triangle dividing 360 in three; the number 144 has for BCD with 360 the value 72, which corresponds to the angle in the center of the regular pentagon, 144 is thus situated on this pentagon. To return all this readable for the spectator who would look at the picture, I decided to attribute a color to each of these 22 polygons and to apply them in every compartment on the striking edge of the object, the natural frame of my picture (fig. 1 and 2). The choice of colors was sometimes imperative upon me as an obvious fact and put me other times some problems of coherence. At the beginning the thing turned out to be easy, the number 1, bound to 7, to prime numbers and to all those who have no other common divisor with 360 than 1, took the white color. Then 2 was light yellow. 3 light red. 4, the double of 2 and thus bound to it, took the bright yellow color. 5 inherited from the azurean blue, that was obvious... From there, three primary colors being attributed, the following ones became clearer quite naturally : 6 orange, 8 beige, 9 lively red, 10 light blue more intense. To every new family of numbers, a new family of colors. With 12 began the series of browns, bound to that of red-orange. 15 was purple, by combination of 3 red and of 5 blue. For 18, the logical result of 3, 6 and 9, a dark red. For 20, the double of 10, the blue intensifies... For 24, a beige darker than that of the 12. The color of 30 was my first faux pas : I began by attributing it a more intense blue than the one for 20 and less than for 40, but later, by arranging my colors in the "boustrophedon" schedule, I understood that its color must be bound to that of the 60, 90 and 120, so the green was choosen. The 36, another multiple of 12, thus a more intense brown. 40, the double of 20, obtained the last one and the densest of blues. The second problem, similar and in a way opposite of the precedent, was the one of 45 : at first, I associated it with green, a little more clearly than 90, its double, be associated both by their positions on the octahedron or the square, but it is finally the color dark purple that got established, as regards an odd number, produced by 5 and 9 and thus associated with 15. The number 60, took from the beginning the green color (I ignore why); 72 was the darkest brown of the series; 90, a dark green; 120, the darkest green; and the last one of divisors, 180, not being able to take a particular color because there is no polygon in two sides, but being situated on the square and thus bound to 90 and to 270, received the same green as these (fig. 3). So every point of the circumference received the color of the simplest polygon to which it belongs. A single point belongs to all the polygons, the last one, the compartment 360. I thus attributed it the black color, the sum of all the others. Symmetries and cycles according to which colors obtained by my classification are situated throughout the circumference brought me to make certain observations. In a first plan organized in 8 rows of 45 numbers, I well realized, by observing in detail, that each of these rows was organized with regard to the numbers 3 and 5, and that all the board was endowed with a perfect central symmetry, generated by the shape and the placement of all the polygons. But, to approach me at best the circular shape, I thought of the second schedule (fig. 4) Arranged in boustrophedon writing (the even rows being ordered from right to left with a withdrawal at the end of every line), which reveals in a more obvious way loops, repetitions of the arrangements along the circle of colors bound to the values 15 and 30 - these values creating polygons in 24 and in 12 sides, traditional divisors of time and of cosmos. So came the idea to accompany this work with a schedule to make it the more obvious reading, in particular with regard to angles 45 ° and 30 °. fig. 4 : table in Boustrophédon of the 22 colors associated with 22 regular polygones the angle of which in the center has an integer value. For every number the associated value is the one of the simplest polygon of which this point is one of summits. We can say that the numbers bound by their color in my intuitive classification find themselves very close from each other in a modulation of 15 in 15, with successive inversions of similar segments. A structure appears in a obvious way in the organization of this suite of numbers classified according to our criterion of divisibility of the circle in integers. By their respective positions, colors are bound : 3 and 9 / 6 and 18 / 4 and 8 / 12, 24, 36 and 72 / 15 and 45 / 20 and 40, which are on the same columns / and finally 30, 60, 90 and 120, positioned in the outside borders. This frame of colors being set up, it was time to pass in the realization of the image itself. My first step was to make visible two polygons : first, the pentagon (fig. 1) - Because in the factorization of 360, the number 5 is the last one and the only one who appears only once (360 = 2 cube x 3 square x 5) ; then, the first polygon which is not one of the 22 to wich a color was attributed, the regular heptagon, which divides the circle into non integer parts (the angle in the center is 51,428571 °) - it is impossible to build it with ruler and compass, and we could suppose that both facts are connected. I drew the sides of the first one and the radiuses of the second. My circumference would be divided into 7 equal shares, each one crossed by a portion of the pentagon. With this first line occurring in each of my "compartments", I could begin the creation of the images by trying, as usual, to release me from any narrative project and to let at first the eye guide the hand as the diverse geometrical elements would be set up. Because lines indeed tend to become objects and these acquire then a narrative function. The number of "compartments" is a priori associated with no particular symbolism, it could involve as well seven days, seven ages, seven colors, seven visible planets, seven favors, seven notes of the range or seven dwarfs, etc. Their function is to be in relation the some with the others within this particular circumference, lined with "coded" colors, and to be the exception by the nature of the figure 7, that's all. Previously in my work, other properties of the numbers or the geometry frequently inspired me subjects, compositions or colors, but without it being visible or perceptible so much the attention of the spectator is immediately monopolized - and too often only - by the image and its aspect perceived as narrative or anecdotic. This time, I wanted to develop not only an image obtained by geometrical experimentation which often happens at the beginning of my visual constructions, but the process itself and I was in front of strange discoveries which continue to be source of ideas and reflections. It is one of the purposes of my work of painter : give to the images a poetic function with the rigor of mathematical laws, wonder about the world, to analyze it, to paint a portrait of it by means of the most precise instruments which it supplies us to explore it (the numbers and the geometrical figures) ; express "theorems" on the alive, the thinking, the sensitive ; make this work with some of the traditional tools of the art : the material and the image. And reciprocally, use the artistic process to reach a better understanding of the mathematical abstraction of the numbers and the figures. fig. 1 la Roue, ( Ø120 cm., 2001). fig. 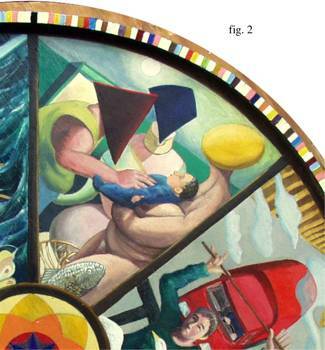 2 la Roue, detail. fig. 3 Table of the 22 colors with the value of the angle in the center (top) and numbers of sides of the polygon (bottom). fig. 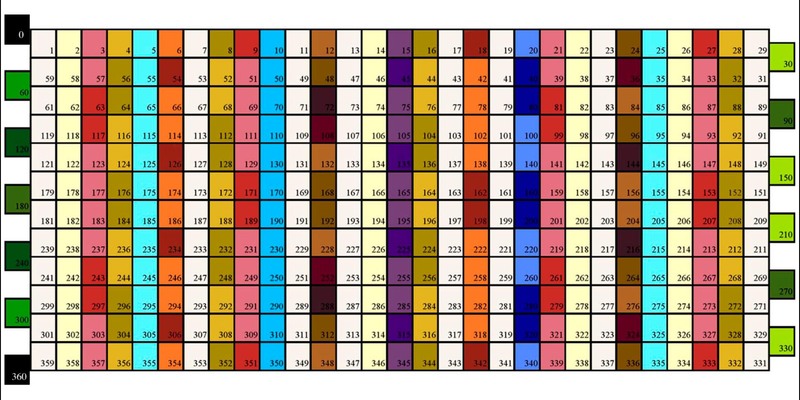 4 Table "boustrophedon" of colors and numbers from 1 to 360 in relation with the angle 30°.